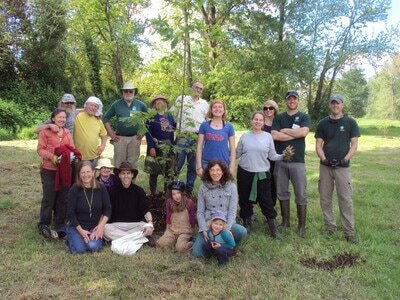 The Green and Resilient Neighborhood Initiative is a project of the River Road Community Organization. The goal of the Initiative is to create a more green, prepared and resilient River Road and have fun doing it. The Initiative will include a series of classes, tours, work parties, socials and events this summer in River Road. All these elements support each other. The city programs have important content on their own but are also a great way to meet neighbors, once people know each other, they can work together in ways that go well beyond the original program. 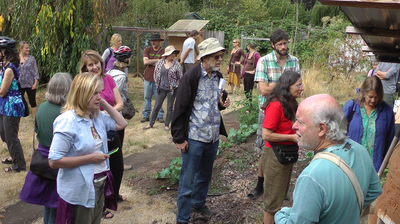 Site tours show what many home and neighborhood initiatives can look like [see fotos below]. Ideally, after the classroom sessions and site tours, people will want to apply what they have learned to their own properties. That's when the work parties happen. If you would like to help out with the G & R Initiative, please contact Jan. The Earthquakes presentation was very good and well attended. Tuesday, August 8, 7 PM - Neighborhood Watch, City and County. Margaret Mazzotta, City of Eugene Crime Prevention Specialist and Sgt. Carrie Carver, Lane County Sheriff's Dept. will explain Neighborhood Watch, an iconic program that brings citizens together to deter crime for making communities safer. Classroom. Tuesday, August 15, 7 PM - Mapping Your Neighborhood [MYN]. Carlos Barrera, citizen advocate, will explain the basics of MYN, a popular and effective national program for building and strengthening disaster readiness among neighbors. Classroom. Saturday, August 26; Site Tour II [bikes recommended], 1 PM, meet at Rosetta Park, Evergreen and Benjamin, 4 blocks northwest of Horn and River Road. 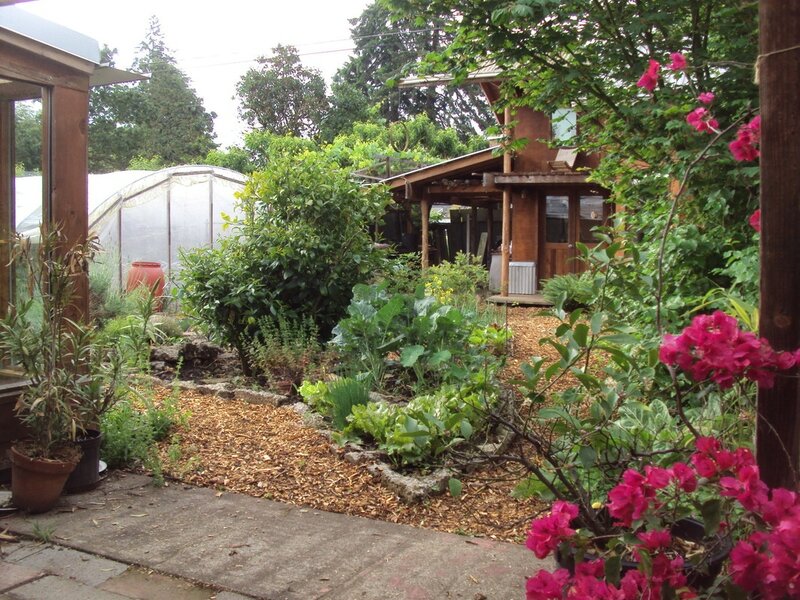 See locations in River Road that feature grass to garden, edible landscaping, solar design, collaborations between neighbors and much more. September 17, Sunday. Sunday Streets in River Road. Eugene Sunday Streets events promote healthy, active living by opening the city's streets for people to walk, bike and roll in a car-free environment! Many healthy and fun activities and community groups participate. The RR G & R Initiative will provide a permaculture site tour and a green and resilient skill share, perhaps food storage, edible landscaping, rain water catchment, permaculture, compost making, grass to garden, tiny homes. 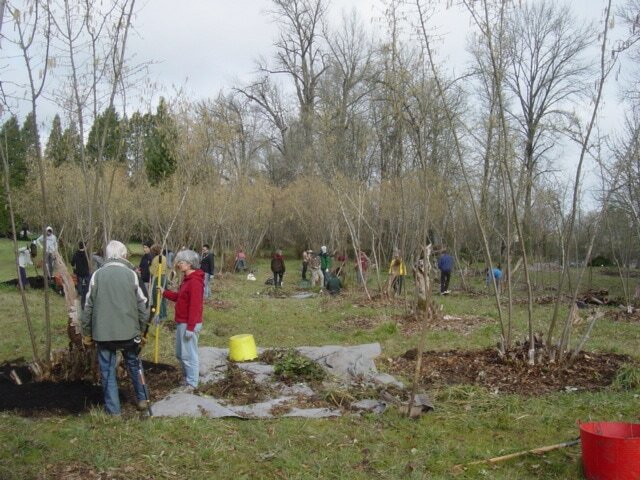 The RR G & R initiative will include socials and work parties as well on private and public property TBA - River clean up, the Filbert Grove, Rasor Park, Heron Slough, East Maynard Park, Rosetta Park. 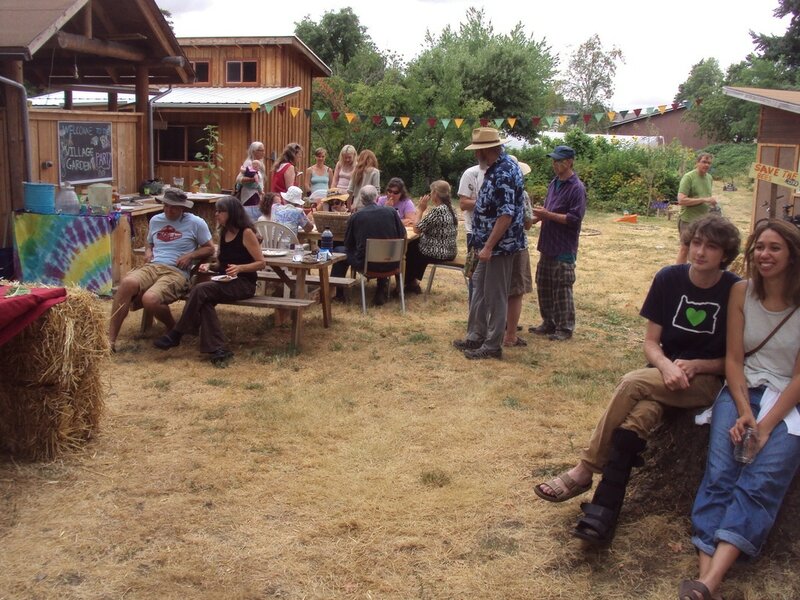 We very much want to have work parties at peoples' homes to help them become more green and resilient. Tasks like turning grass to garden, planting fruit trees, maybe taking out a driveway, building raised beds and more. Note, the host needs to arrange for all tools and material. Pizza and beer also recommended. Contact Jan if you would like to host a work party. Please share your thoughts and helping create a more green and resilient River Road. Here is a survey. If you would like to receive the River Road Community Organization's newsletter about neighborhood issues and events, please contact Clare. There are many ways River Road Neighbors can help make River Road more green and resilient. The Initiative and help connect people to these kinds of actions. 3] The G & R Initiative is intended to catalyze interest and actions for greening our homes and properties. Some of the actions are great for work parties. Participants can host a work party. Please provide tools and materials, lunch. 4] People meeting and making common cause can create all kinds of mutual assistance networks to address any needs participants care to address. 8] Make our own homes, properties and lifestyles more thoughtful and purposeful. Reduce eco footprint. 9] Become involved with RRCO. Come to meetings, share your thoughts, participate. 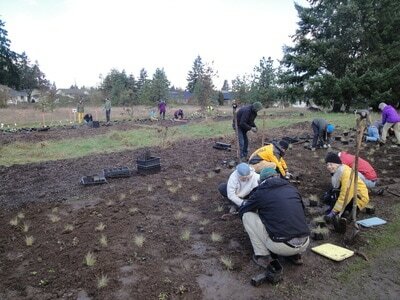 Fotos below show Green and Resilient activities in River Road. Hover the cursor over the foto for a caption. Clik for a larger image. RRCO is a city affiliated neighborhood organization that benefits both city and county residents. The RRCO Board has both city and county residents. The city of Eugene neighborhood program provides modest support and services to Eugene's 22 neighborhood organizations including RRCO, to help them be effective in their projects and work to create safer and healthier neighborhoods. RRCO meets at the Annex, 1055 River Road, 7 PM, the second Monday of the month. Each Neighborhood Association [NA] sets its own agendas and decides its own issues to work on. Typically, they include land use, traffic, public safety, the environment. Every neighborhood has its own set of assets and challenges. Each NA works to improve the quality of life in its neighborhood. Projects and initiatives reflect the interests to those who participate. Resiliency has become a familiar word. We all know we are overdue for a large earthquake that could leave the Pacific Northwest disrupted for months and even longer. That's not all. Economic, technical, public health, social, political and environmental uncertainties are already familiar in the news. Each could disrupt our transportation, food, health care, communications and energy systems by themselves and even more so in combinations impossible to predict. Being prepared takes in a wide range of approaches. Fortunately, preparing for one disruption helps to be prepared for the others. Priorities of resilience include not only storing food, water, medical supplies and other essentials but just as important are our own lifestyles and making contingency plans with our neighbors. These actions can serve us well, disruptions or not. 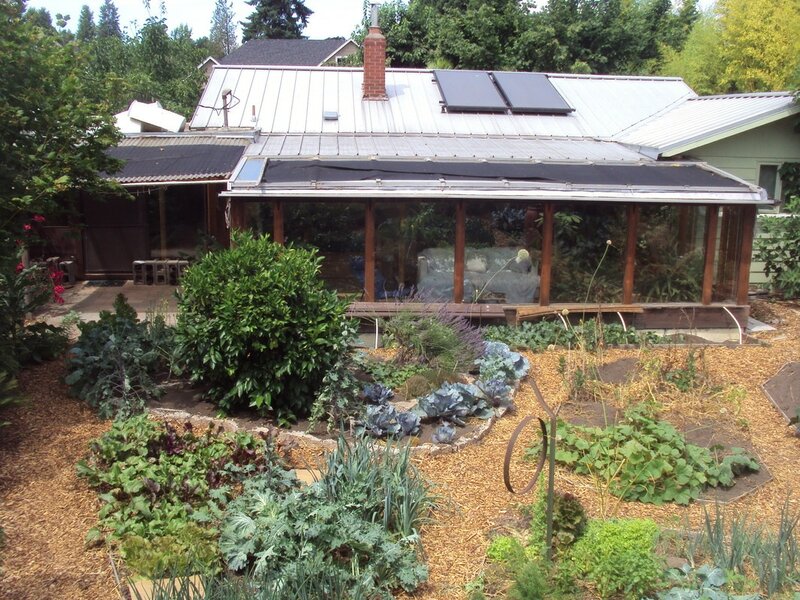 Creating green and resilient homes and lifestyles lead to many benefits. 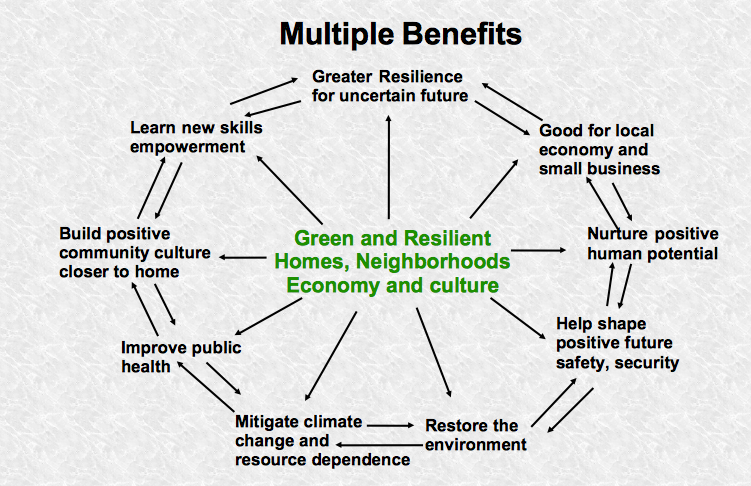 Green approaches can mitigate the severity of disruptions, build community cohesion and even help create jobs. Green homes and lifestyles leave a smaller eco footprint which mitigates climate change, reduces individual and families' cost of living and can free up personal time for community involvement. How people spend money is a significant choice. For example, instead of a new car, one could buy several bikes plus an edible landscape plus a rain water catchment system plus converting a south facing patio into a sun room that can help heat the house and become a favorite place to entertain friends or start a new hobby and create local jobs. Green projects are models that can inspire others. 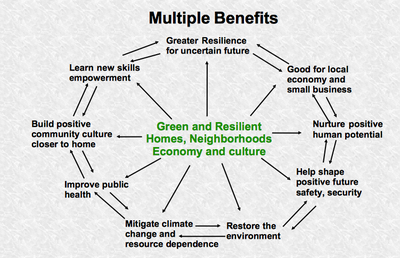 A resilient home is great but the scale of these strategies needs to expand into the neighborhood and community. Every town has existing and surprising assets like non profits, ad hoc groups, city programs, communities of faith, schools, businesses to name a few. These are all potential partners and allies to work with. 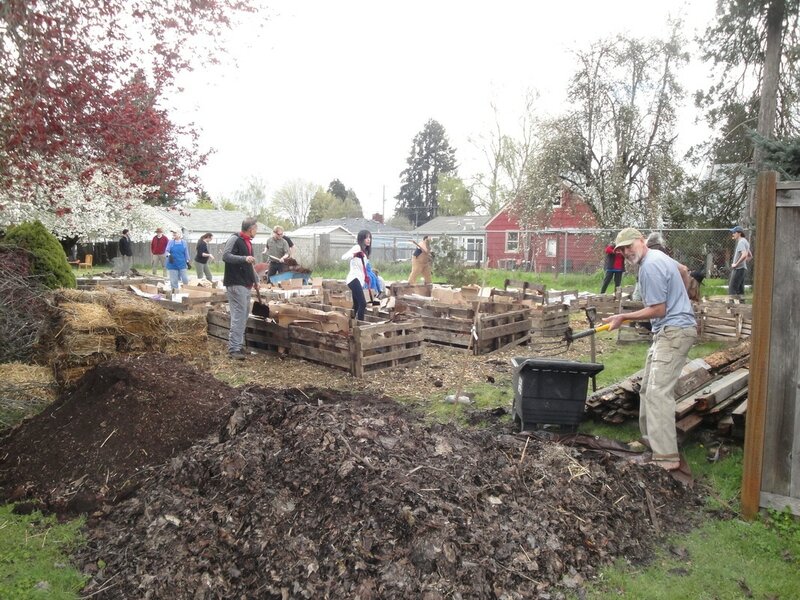 In Eugene, the city offers a variety of programs for building safety, security and resilience at home, the neighborhood and community. Neighborhood associations, Neighborhood Watch, Mapping Your Neighborhood, CERT Training, neighborhood matching grants and city volunteer programs all empower citizen initiative. These are all excellent opportunities to build safety and security and have already benefited many thousands of people in Eugene. Taken together, they offer trainings, class room sessions and emergency skills in simulated conditions. People receive professional support while learning useful skills for working together. Even more, these programs can serve as social ice breakers for neighbors to discover shared interests. Learning resilience skills and discovering other common interests mean participants can take on more ambitious projects to build safety and resilience, especially if the programs’ trainings specifically encourage participants to go beyond the basics. For example, front yard gardens are a perfect match for Neighborhood Watch and Map Your Neighborhood. 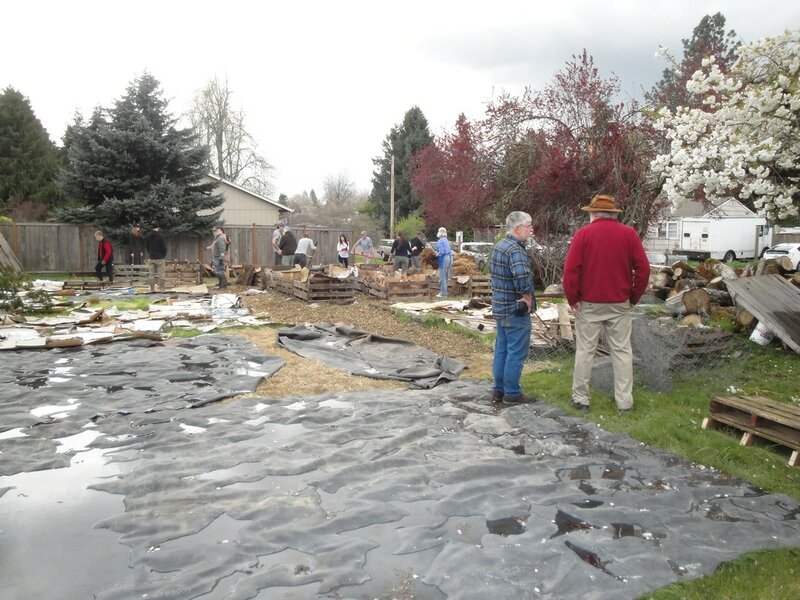 Neighborhood Associations are perfect to help promote front yard gardens. A front yard garden is eyes on the street, a great way to meet neighbors, enjoy exercise and fresh air. The food produced is secure from disruption. Creating front yard gardens deserves to be a community campaign involving every public, private, ad hoc and business organization in Eugene. Churches, mosques and temples should be in the vanguard for creating green and resilient homes and neighborhoods. Their values of service to the community, care for the natural world, modest lifestyle and social uplift are perfect for green and resilient lifestyles. Schools, scouts, businesses, non profits, ad hoc groups can all help create green and resilient homes, neighborhoods and community. 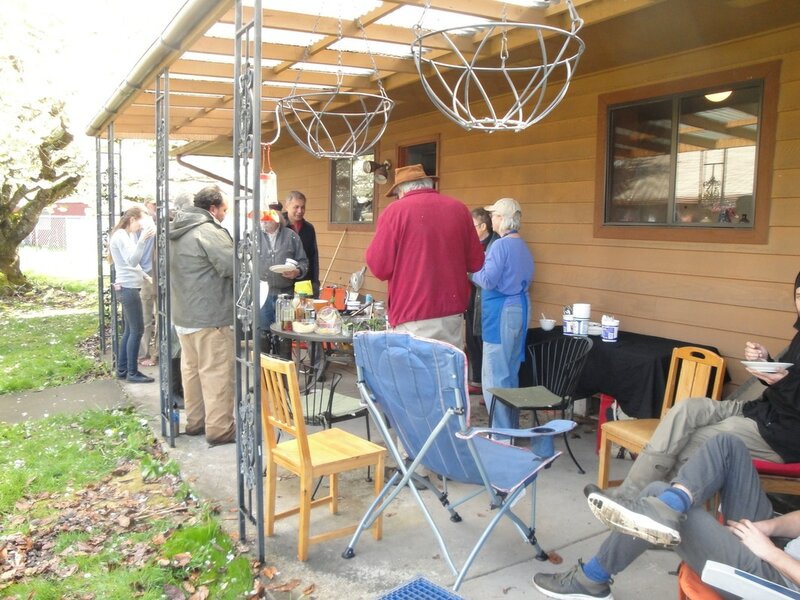 When there are enough green and resilient projects in place near each other, the group could organize a site tour and invite neighbors and friends for a show and tell to inspire them to do likewise. 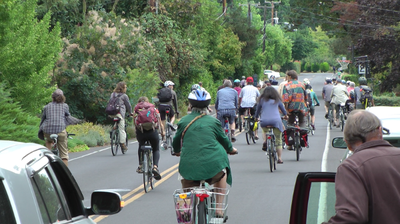 There have already been dozens of such tours in Eugene over the years. There is good reason to have many dozens more all over town. Creating green and resilient homes and neighborhoods rebuilds civic culture, reduces our eco footprints, supports a local economy, improves public health and make us less vulnerable to disruption. An enormous bonus, these actions provide a way for all of us to manifest our positive potentials and talents. There has never been a better time in history to make our homes, lifestyles, neighborhoods and community more green and resilient.